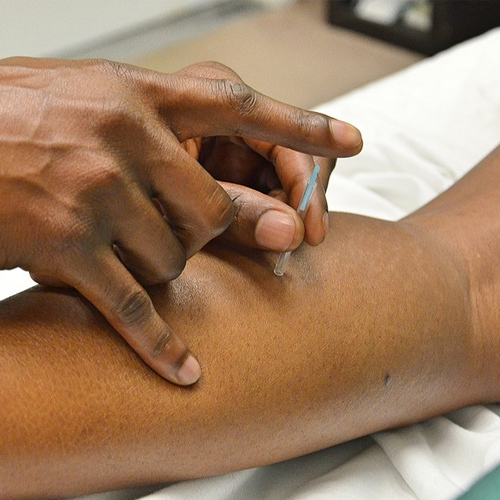 Dry Needling is a safe, effective and efficient treatment for correcting muscular tightness and weakness, releasing trigger points and relieving pain. With injury or chronic strain abnormal muscle trigger points or “knots” can build up in your muscles. These trigger points are often painful and interfering with the flexibility of the underlying muscle leading to soreness and stiffness. These trigger points can cause and refer pain throughout your body. One common example would include the muscles in the back of the neck and shoulders being capable of referring pain to the head commonly known as “tension headache”. In Dry Needling, acupuncture needles are used to target the trigger points of a problem muscle, often described as a muscle ‘knot’. The needle is gently inserted into the skin directly at this point to stimulate the trigger point, jump starting the muscle and nerve supply and increasing the blood flow to the area which helps to relax and heal the muscle. After dry needling treatment, the area that was treated often feels much softer and relaxed and the person will feel looser. Dry needling can be successfully combined as part of a treatment programme at Gorey Family Chiropractic. If you are interested in talking with one of our experienced chiropractors about the benefits of Dry needling and whether it may be an option to treat your pain, Book an appointment today.